With hundreds of restaurants in town, Portland always has some that are coming and some that are going. Portland and Rochester Public House is one of the new ones that piqued my interest. Located on Preble St. and named after a rail line that was previously in the building, they focus on local flavors and ingredients according to owner Garrett Fitzgerald. Those comments on the web site made it certain I was going to pay them a visit. Walking in, I was pleasantly surprised. The bar was beautiful and the restaurant’s rustic theme was cozy and relaxing. If the rest of my time there was going to match my initial feelings, it was going to be a good night. We walked toward the bar and someone who appeared to be grabbing drinks told us that he’d get the hostess as she knew the seating and reservation arrangements. That made sense to me and within a minute or two the hostess arrived. A couple minutes later, we were being seated. The dining room continued the rustic theme from the bar area. Again, it was a relaxing atmosphere and featured a couple semi-private tables on a small stage. We browsed the menus which had food on the front and drinks on the back. When the waiter came, it was the same gentleman who had originally greeted us. He poured us water and we asked about the vegan course which the menu said changed weekly. He told us about the one that was available the previous night, but said he’d check if it had changed as he hadn’t spoken to the kitchen yet. We told him that it would be another minute before we were ready to order drinks. There were a great selection of wines, beer, and hard liquor on the menu. I generally focus on the house cocktails as I always feel that gives me a good sense of what the restaurant has to offer. Are they giving choices that are innovative? Is there something for everyone? Do they offer good, overall variety? I think all these are important and oftentimes provide some insight into the food. While the house cocktail list was small, it had some really cool options and had a great selection of spirits if you wanted to create your own. Our server’s return timing was perfect as we had just made our decisions when he came back. I ordered the Beet.nik – house made golden beet vodka with ginger and lemon. I heard the waiter telling someone at the table behind us that the vodka was Maine Twenty2 Vodka. My wife, now on a hard cider kick, took a Magner’s Irish Cider. We were told that the vegan choice did indeed change from the night before. Drinks came out relatively quickly and we were ready to place our food orders. We decided to share the Lobster Cakes with harissa and picked shallots. She couldn’t decide on an entree so instead went with the Manhattan Clam Chowder and an order of the Fries. I was all in for the Scallops and Bacon with pork belly and succotash. The waiter walked away and we sipped our drinks. “Holy vodka! What the hell was in this drink? Oh yeah, pretty much just vodka.” As I looked at the drink description again, I realized that ginger and lemon probably weren’t a huge part of my drink. It was really tasty though with strong golden beet smell and flavor, but hardly a hint of lemon or ginger. And it was strong. The verdict was that I loved it. Powerful, flavorful, and refreshing, the drink had it all. My wife loved the cider. We continued to sip our drinks until food came out. When the Lobster cakes arrived, I was pleasantly surprised by the size of them. Much bigger than what I was used to, they were topped with the shallots and had the harissa chili sauce underneath. We each put one on our plates and I quickly took my first bite. I was really impressed with the preparation. They had a great crunch on the outside, but were tender and soft on the inside just like me. The flavors were excellent and the sauce was plentiful with a little spice and great creamy texture. There was an obvious lobster flavor that I didn’t need to search for. At this point, I was really starting to get fired up about my entree. As meals being delivered to other parties passed us, the smells wafted over to us and I became ravenous. Fortunately, it didn’t take long and I saw our food coming from the kitchen. It smelled like magic and looked like an angel. My wife was told that the fries were seasoned with ingredients that included sage, rosemary, thyme, and fairy dust. With that, I made it my goal to try her fries first. I reached my grubby, little paws over to my wife’s bowl of fries. There was a cup of ketchup there, but I didn’t need it. I grabbed two fries and chomped them down. They were good…very good. The combination of herbs and spices, the freshness, and the crispness made them a sure winner. I refocused on my food. 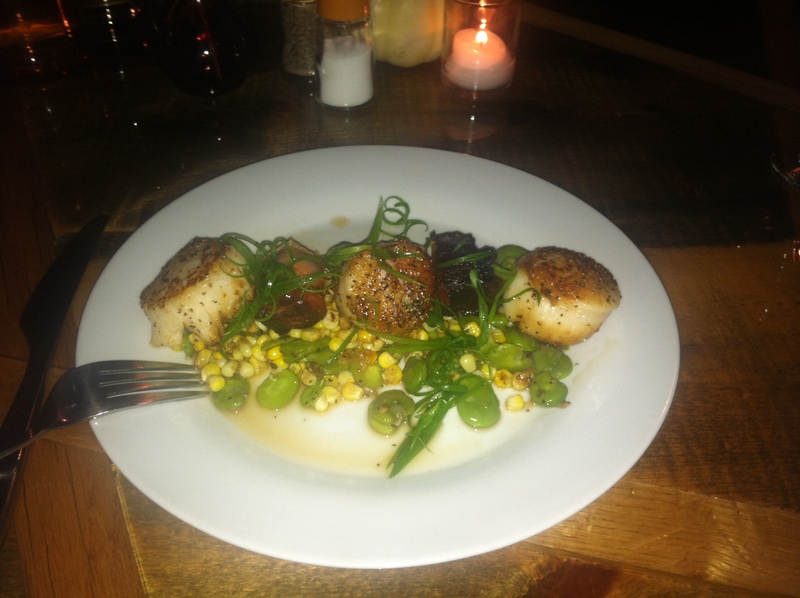 My plate had three large sea scallops on top of a pile of succotash. There were also two pieces of pork belly between the scallops. I tried a bite of the succotash – a corn and lima bean combination. I couldn’t believe it. It was extraordinary. The intense flavors from the seasoning combined with a salty bacon/pork fat flavor and the sweet corn were absolutely out of this world. It might have been the best side to come with an entree that I ever had. Yup, it was THAT good. I looked at my crispy pork belly. I’m not one for eating the clear fat by itself and I wasn’t about to start, but I was sure as hell going to eat the crispy outside. I cut the darker piece off and tossed it on my tongue. It was another huge success. It had intense pork flavor that just didn’t quit. I cut myself a piece of scallop and it was awesome. Mrs. Portlandeater was quite happy with her meal and spooned me some chowder. It was good, though I’m a New England clam chowder type of guy. She likes it Manhattan style and this was no exception. She loved the chowder and fry combo. We ate all of our food. I couldn’t believe how good mine was. When our waiter stopped by again, we decided to order the PB and J Beignets which were dusted with peanut butter and served with house jam. As with the rest of the meal, the beignets came out quickly. The little doughnut holes were cute and ready to be eaten, so I did just that. I cut one in half which was no easy task with the slightly hard and crunchy outside. I dipped it in the jam. It was good – sweet and doughy in the middle. The peanut butter flavor was a bit weak. The jam was similar to apple butter. It was a great ending to a great meal. Reasonably priced, our meal came to just a notch below 70 bucks before tip. Portland and Rochester Public House is definitely onto something. I had heard mixed reviews prior to visiting, but there was no uncertainty on my part. The food was amazing, the service was right where it should be, and the scenery was among the best around. The worst criticism I have is that the beignets were a little short on peanut butter flavor. Other than that, the food was perfect right down to the last lima bean in my succotash. From what I hear, there is a separate bar menu and I haven’t eaten from that yet, but if you want an awesome dinner, go to the Portland and Rochester Public House dining room and just sit back and enjoy the first class experience. This entry was posted in Portland, ME food on November 17, 2013 by peterpeterportlandeater.